With the introduction of SMAVIA, Dallmeier takes one more critical step closer to the IT industry. SMAVIA is a recording technology which is based on 25 years of experience and competence in professional video security technology; thus, ensuring maximum reliability. SMAVIA enables the recording of video images and streams in a large variety of image compression and transmission codecs (H.264, MPEG-4, MJPEG). In addition to standard definitions, SMAVIA also supports Full HD (1080p) and up to 8 megapixel. “For the first time in our company’s history, we are in a position to market our expertise in the realm of recording technology uncoupled from any given hardware platform: SMAVIA is available for purchase in a “software only” variant. As the name suggests, customers only buy the software – this includes both the recording and the management software – and can then install it on their own servers. In addition, there are special appliances, that is to say Dallmeier hardware platforms, on which the software has already been preloaded”, is how Dieter Dallmeier explains the new concept. 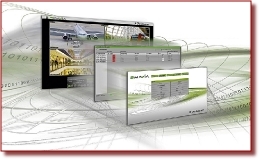 The SMAVIA Recording Server Software can be used on a wide range of different hardware platforms; either on special video recording servers made by Dallmeier or as a stand-alone software on standard servers or PCs. SMAVIA is compatible with both Linux and Windows. The corresponding management software SMAVIA Viewing Client offers the perfect interface for the comfortable processing of live pictures and recorded pictures. By the way: In conjunction with the Security Management System SeMSy® SMAVIA supports cascaded recording systems with 2,000 video channels and more. A particular SMAVIA highlight is its compatibility with ONVIF: ONVIF-compliant cameras can be configured and recorded with SMAVIA. Obviously, SMAVIA also supports the proven PRemote-HD function. PRemote-HD is a method developed by Dallmeier that uses transcoding to enable the transmission of HD and megapixel streams even at low bandwidths. PRemote-HD is particularly useful for locations where images need to be recorded at highest quality but have only a low-bandwidth network available, for example DSL networks with a 128 kbit upload. As opposed to standard transmission methods such as Dual Streaming that allow users to only change quality settings for the transmission of live images, PRemote-HD also offers a bandwidth-saving transmission of recorded images. Therefore, it is not only possible to view live images, but also to evaluate recordings over great distances in highest resolution. The SMAVIA licensing model is attractive because no license is required for the Viewing Client. The entire handling of software variants and license dongle is eliminated. The licensing is based centrally on the Recording Server. Maintenance products and warranty extensions have not been offered for recorders and software of generation 3 and 4. The warranty period for the recorders has been set using the general terms and conditions or arranged for special distributors / projects separately. Updates for software have been offered from case to case, sometimes subject to costs. However, in the IT branch it is usual to offer the possibility of a warranty extension for devices. The maintenance of software is ordinarily not offered on a case by case basis. It is provided at a flat rate for a specified time frame, which can then be scaled according to requirements. Meeting these requirements the new “DCP - Dallmeier Care Products” are introduced as concerted maintenance products with SMAVIA.